113 mods as of 2019! As of 4/2/2019 (4th February 2019). To get the latest FLIGHT.EXE, click here. This sticky topic is to present and discuss the latest Tornado modding work by AH...and the odd one or two by me. AH is a Tornado fan who works in the aviation industry. He was inspired by Tornado when it came out in 1993. 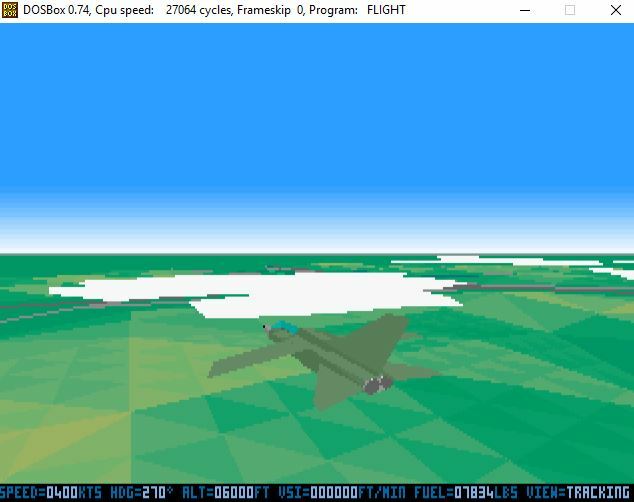 Having rediscovered Tornado in 2017 through the Tornado website., he has combined his past 16-bit assembly language knowledge, with his love for flight simulation and his aviation experience to see what he can do to enhance Tornado. He also plays DCS. Disclaimer: these mods only work on the NON-Operation Desert Storm of Tornado. In addition, we are both busy persons and will only mod when time and real-life permits. List of mods done so far. #111. Frankie 01/02/19 Improved status bar with informative autopilot code. #110. Frankie 21/01/19 Pryotechnics - adding fire effects. #109. Frankie 19/01/19 Lower Terrain Following Radar Ride Heights. #108. Frankie 07/01/19 TAB Flight Plan Display (FPD) now shows wingmen location with respect to waypoints. #107. Frankie 01/01/19 Tornado death improved#1. #106. Frankie 17/12/18 No more "rotation of death" when player's Tornado is destroyed. #105. Frankie 26/11/18 Tracer colour variety to distinguish Tornado Mauser cannon rounds and enemy AAA rounds. #104. Frankie 17/11/18 Swapping 3D models - fly the Tornado as an A10 for fun. #103. Frankie 16/10/18 Enhanced flyby for tornado with just F3. #102. Frankie 17/09/18 Fancier flyby for tornado with F1 and F3. #101. Frankie 10/09/18 Indirect ALARM plume when diving, is recreated in Tornado1.0a source code!. 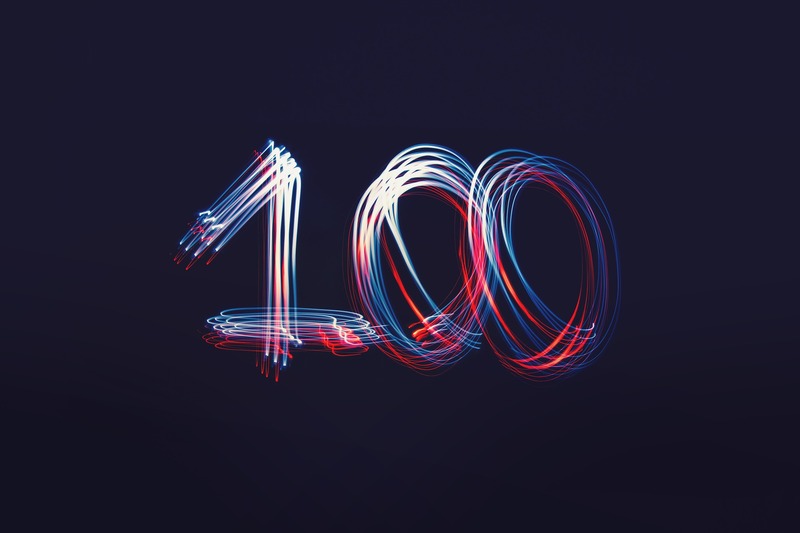 #100. Frankie 09/09/18 Solved bug of Waypoint Countdown at last!. #99. Frankie 02/09/18 Restored Credits screen with Polygon count meter. #99. Frankie 01/09/18 Big Shadow below Tornado (pseudo-mod!). #98. Frankie 31/08/18 Big Map's Explore mode is now improved. #97. Frankie 31/08/18 Big Map now works in 3 roles - as the original Big Map ('M' key), Split-Screen half-screen and in Explore mode. #96. Frankie 26/08/18 Big Map now works in Split Screen as half a Big Map - use with TV-Tab and half-screen FLIR . #95. Frankie 24/08/18 Added ADV Tornado F3's HUD to split-screen view. #94. 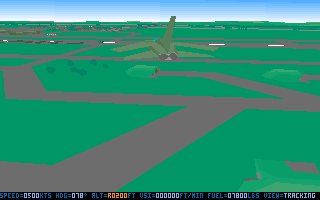 Frankie 23/08/18 ADV Tornado F3's HUD now works in full-screen view. #93. Frankie 18/08/18 Increased initial zoom level of the Big Map, Moving Map and Reference Map to Level 2 Zoom. #92. Frankie 18/08/18 Split-screen TV-Tabs and MFDs will be damaged if the Pilot's and Navigator's TV-Tabs and MFDs fail. More realistic. #91. Frankie 19/08/18 Trees are now shown in three colours, giving the landscape some visual diversity. #90. Frankie 15/08/18 Split-screen top-half-screen FLIR's HUD now has a superimposed RWR symbology. #89. Frankie 11/08/18 Zero-fuel immunity against Infra-red seeking SAMs. #88. Frankie 05/08/18 Split-screen FLIR display with overlaid TV-Tab display and MFD (assembly language multi-tasking). #87. Frankie 05/08/18 Weapon View ('v' key) horizon can be now be adjusted up or down. #86. Frankie 04/08/18 Split-screen FLIR display with working HUD in top-half of screen. #85. Frankie 01/08/18 Split-screen FLIR display. #84. Frankie 30/07/18 TV-Tab FLIR and TIALD views in External Views. #83. Frankie 26/07/18 When in an external view, mini-displays can be cycled through forwards and backwards with 3 and Shift+3. #82. Frankie 24/07/18 When in an external view, mini-displays can be toggled on/off in sequence by pressing the 3 key. #81. Frankie 23/07/18 When in an external view, the E-Scope Terrain-Following display can now be toggled on/off with the 3 key. #80. Frankie 23/07/18 Weapons view can be roll angled by hitting Alt+P. Makes for nice angles of ordnances falling. #79. Frankie 22/07/18 Horizon pitch can now be adjusted up or down in Spectator mode. #78. Frankie 19/07/18 Changed AAA sounds from Explosions2 to SoundCannon. #77. Frankie 09/07/18 Standard TIALD view in TV-Tab is more 3D-ish now. #76. Frankie 08/07/18 Shift+D in Navigator's Cockpit will activate the full-screen FLIR and TIALD. #75. Frankie 28/06/18 Functional Pause/Unpause key with a subtle hint of screen darkening. #74. Frankie 25/06/18 Enhanced Explore mode . #73. Frankie 22/06/18 Improved stars and Tornado colors for Night Vision mode (more natural and better contrasting colors). #72. Frankie 17/06/18 Roll Indicator Value shows the value of between 000 to 511 in the External Panel's bottom status bar. #71. Frankie 15/06/18 Toggle shake effects, due to Tornado damaged components of the Tornado, on and off. #70. Frankie 15/06/18 Raising and lowering the horizon now also shifts the Tornado's vertical perspective (via the "1" and "0" keys). #69. Frankie 15/06/18 Proper Shake and sound effects of exploding ordnances for external views raises the realism and fun factor. #68. Frankie 05/06/18 The horizon in the F3 Flyby view and F2 Checksix! views can now be raised/lowered with the keys "1" and "0". #67. Frankie 29/05/18 Made smoke circles smaller and with shorter expiry times. #66. Frankie 29/05/18 Added two new views: AAA (ZSU-23-4-Shilka2) and ZRK Romb (Gecko) external views. #65. Frankie 28/05/18 Added a AAA (ZSU-23-4-Shilka2) to Tornado view with the F12 key. #64. Frankie 27/05/18 Enabled slewing left-right of Tornado and Drones with the "2" and "9" keys. #63. Frankie 26/05/18 Added F11 key to activate SAM Launcher to Tornado viewpoint. #62. Frankie 25/05/18 Vertical height of Drone views (F5/Shift+F5/Alt+F5) can now be adjusted with the 1 and 0 keys. #61. Frankie 21/05/18 TIALD view has a 3D perspective to it, bombs hit dead-on the lowered crosshairs. #60. Frankie 18/05/18 Waypoint countdown timer in external views are now colour-coded. #59. atariby 18/05/18 Analogue joystick mod (Tornado now works with Saitek and other HOTAS analgue joysticks!). #58. Frankie 17/05/18 External views now show the current waypoint letter on the bottom status bar. #57. Frankie 15/05/18 You can toggle the game's theme music (Soundblaster) on (F5) and off (F4) now. #56. Frankie 05/05/18 Enemy airfield lights are now blacked-out during low-light times (i.e., night, twilight and dawn). #55. Frankie 04/05/18. User can pan the Checksix view on the horizontal axis with Z and X keys. #54. Frankie 01/05/18 Redesigned bomb impact view and now more External views vibrate/shudder when ordnance explode. #53. Frankie 25/04/18 Fluid horizon in Tracking View. #52. Frankie 23/04/18 Adjustable viewing height of the Tornado in the Tracking View. #51. Frankie 22/04/18 User can toggle the responsive horizon, in the Tracking View, on and off. #50. Frankie 10/04/18 Instant activation of Full-screen FLIR view. #49. Frankie 09/04/18 Full-screen FLIR view now allows HUD to be toggled on/off. #48. Frankie 09/04/18 No more tree cluster in Warzone2's Mission 3. #47. Frankie 07/04/18 More clouds for Tornado when run via GUI-based game. #46. Frankie 01/04/18 Cloud Mod (more clouds than the stock game). #45. Frankie 31/03/18 Stable Tree Mod (more trees than the stock game). #45. Frankie 24/03/18 Auto-generates 300% more random trees on the Tornado landscape as compared to the original game. #44. Frankie 21/03/18 Added 5,000 more trees to the Tornado ground landscape. #43. Frankie 18/03/18 Full FLIR/TIALD view to Navigator's Panel. #42. Frankie 18/03/18 Improved the "Check-Six!" view with F2. #41. Frankie 19/02/18 Toggle NVG/normal night colours on-the-fly. Adjust HUD colour intensity on-the-fly. Better gameplay now. #40. Frankie 16/02/18 Made SAM hits more lethal. On the average it takes 3 to 5 SAM strikes before you're toast. #39. Frankie 13/02/18 Code detects if Tornado mission is for IDS, ADV or ECS and auto-adjusts the sky-to-ground height ratio;. #38. Frankie 11/02/18 Added flare and chaff counts in full-screen FLIR and TIALD modes. Added MFD in TV-Tab2 full-screen mode. #37. Frankie 04/02/18 Secondary Control Surfaces Indicator (SCSI) functioning needles added to full-screen FLIR and TIALD. #36. Frankie 25/01/18 Added full set of command line parameters on demand. E.g., FIGHT /e1 /gr /to /tt /nm. #35. Frankie 18/01/18 Added /sh (shake effect) /fs (full screen FLIR & TIALD views) parameters on demand. #34. Frankie 17/01/18 Added red attention getters and warning light board to full-screen FLIR & TIALD views (TV-Tab1/left only). #33. Frankie 15/01/18 F2 rear view is fixed - no more confusing rolling horizon when banking the plane. #32. Frankie 01/01/18 Store Management Display text colours follow the current HUD color - dynamic now. #31. Frankie 07/01/18 Store Management Display now appears at the upper-left corner of the screen in full-screen FLIR/TIALD mode!. #30. Frankie 02/01/18 Pilot's and Navigator's cockpit panels shake effect (once in a while and very subtle). #29. Frankie 01/01/18 A SAM hit against the player's Tornado no longer results in instant death. #28. Frankie 30/12/17 Added the SAM proximity warning sound effect - a life-saver in many situations where swarms of SAM exist!. #27. Frankie 29/12/17 Tornado cockpit shakes when the plane is damaged or in distress. Enhanced gameplay IMHO. #26. Frankie 26/12/17 Added a Community names screen. The Boxing Day 2017 Version of Tornado. #25. Frankie 23/12/17 Added a Credits screen. The Christmas 2017 Version of Tornado. #24. Frankie 20/12/17 Gamer can now choose between the original FLIR/TIALD TV-Tab displays or the full-screen FLIR/TIALD displays. #23. Frankie 12/12/17 NVG (Night Vision Goggles) toggle. #22. Frankie 11/12/17 HUD information is now accurately shown in full-screen FLIR display view!. #21. Frankie 05/12/17 Radar-Warning-Receiver added to fullscreen views. #20. Frankie 05/12/17 Minor Hack. Repositioning of Air Radar. #19. Frankie 30/11/17 FLIR view is ALSO now in full-screen. #18. Frankie 25/11/17 Laser Guided Bomb view is now in full-screen. #17. Frankie 13/11/17 Shilka AAA burst time duration is now randomised to 3..8 seconds. #16. Frankie 07/11/17 A better Lookup view. Shows ground detail instead of high sky. #15. Frankie 26/10/17 Functional Pause/Unpause key. #14. Frankie 22/10/17 Flyby view. #13. Frankie 21/10/17 Wump-Crump-Shake the Tornado. #12. Frankie 19/10/17 Night Vision Goggle effect. #11. Frankie 17/10/17 Checksix view. #11. Frankie 14/10/17 Rotate the Spectator View to catch the action (correction: this feature is already in the stock game!). #10. Frankie 14/10/17 Rotate the craters after hitting (or missing) the target with a custom height. #09. Frankie 14/10/17 Flip the flipping sky and let's give the ground more coverage. #08. Frankie 13/10/17 Set your own terrain following heights. #07. Frankie 10/10/17 Changed the default initial viewing position of wingmen (drone) aircraft. #06. Frankie 10/10/17 Tracking View made more realistic and immersive with responsive horizon. #05. Frankie 26/09/17 Weapons View is now sound-enabled. #04. Frankie 19/09/17 Changing the default Tracking mode initial position of the Tornado. #03. AH 14/08/17 Whole lotta shakin' going on. #02. AH 03/08/17 Gear up with shudder; Good Landing tire/rumble sound on good landings. #01. AH 03/08/17 Tornado Hello World!. If you want to be involved with the coding work of Tornado, or if you are curious to see the behind-the-scenes and detailed discussion regarding Tornado, I would like to invite you to join the Tornado Discord Server..
Notes: See bottom-right corner of the screen. Now that's different! A very minor and trivial change to Tornado, but nevertheless, a very good start. 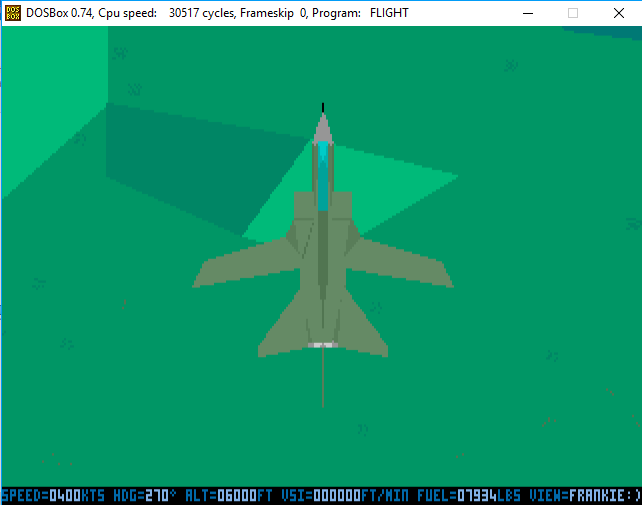 Instructions: Make a backup of your tornado folder and then replace the original FLIGHT.exe in the /FLIGHT/ folder with the modded FLIGHT.exe. 08.02.2017 Added a small cockpit shake when lowering or rising landing gear. A nice touch! 08.02.2017 Added tire touchdown/rumble sound (placeholder) when pilot makes a good landing. Note: prolonged usage of mod will induce headaches and eye-fatigue. This is again proof-of-concept and exists as work in progress. Shaking of the cockpit at the right time and circumstances will make the simulator more immersive and realistic. In the right dose I think this effect would increase the realism, especially for missions flown when visibility is restricted such as night, fog and flying in clouds. And using a "horizontal shake" for turbulence helps differentiate the effect from the "vertical shake" DI used for airframe buffet. Instructions: Hit F1 and instead of the Tornado being dead-centre in the external view of the Tracking mode, it is slightly skewed to the right ... for IMHO, a slight more dramatic effect. The above hack is simple and trivial. What is interesting is that it is possible to implement a cinematic view in Tornado. Similar to the various cinematic views found in Razorback's "Apache Vs Havoc" and "Comanche Vs Hokum". The effort to do this is not trivial, but this minor hack alludes to the real possibility of implementing such complex views in Tornado. 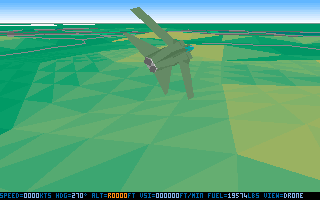 Never mind the outdated 3D model graphics - if new and innovative views could be implemented in Tornado (using 16-bit assembly language, mind you! ), that would take the Tornado experience to a whole new level. I managed to enable the sounds in the Weapons View. So when the target hits home, you will NOW hear an explosion! 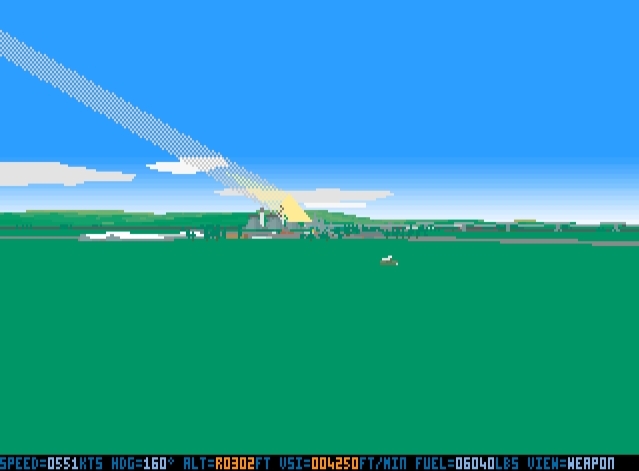 This sound effect is missing in the default code because the moment of impact is considered to be out of earshot range of the Tornado that is traveling at, like what, 600knots, which is a pity really. Imagine working so hard to survive all the way to the target, actually hitting it, only to be greeted by complete .... silence. With my minor hack however, you will now be rewarded with a satisfying explosion sound effect. This will make your blood, tears and sweat all worth it. Here is the simple hack. Just change VIEW_WEAPON from 0 to 1 inside VIEW.ASM! The drawback of the hack is that you will also hear the Tornado's twin-engine sounds every time you toggle to the Weapons View. I am currently unable to turn off the engine sounds when in Weapons View mode. If I could do this, then the drawback would be eliminated. With the hack activated, an ALARM hitting a target (AAA) will result in a digitized bang. Something that the stock game would always show in silence. Link: None. Just follow the code hack shown. This hack will make the horizon responsive when you turn or bank the jet in F1 (tracking) or F5 (drone) views. Just comment off lines that contain the code "VP_ROLL,0". 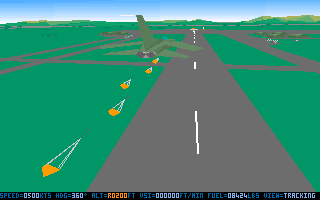 The simulation views will be more dramatic, especially when the jet turns left or right. You have to try this. 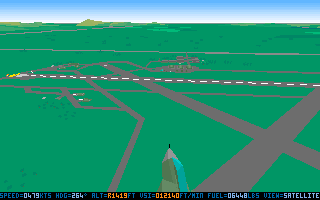 It gives a cinematic feel to the external view when the plane turns to the next waypoints. You feel as though you are a wingman the the Tonka that is being tracked in the Tracking (external) view. You feel right there in the thick of the action. Here I am in F1 view mode. When I bank the plane, the horizon turns at an angle. Works the same when in Drone mode (F5). Give it a try and see the dramatic difference. Hack #6 gives the tracking and drone views a 3D-effect make-over. Remember the aerial scenes in Top Gun? Remember Flanker 1.0-1.5 external views where you had that beautiful angled view with the jet at the corner and the horizon tilts but the jet remains relatively still? Same effect here. If you hit Esc to cancel the autopilot, and then use the right or left arrow keys to turn the plane, PLUS the zoom/unzoom "<", "Shift+<", "Shift+>" and ">" keys. You will see a dramatic effect when in F1 or F5 view mode. Trust me on this! Change the angle values to 260. That's all! Instructions: Open VIEWS.ASM and use the value 260 for DrnCamBrg and DrnCamBrgFine. This hack of changing the zero values to 260 will make all drone aircraft to face AWAY from you. In the default game, the drones always initially face towards you (boring!). Now they will initially be seen from the rear. when the F5 key is hit. During a multi-aircraft coordinated strike mission, it makes more sense to view the wingmen or drone aircraft seen from the back, flying towards the target. This way you don't have to reposition the view with the "z" (pan left) or "x" (pan right) keys. Get it? Link: None. Open the AVIONICS.ASM file. Then follow the code hack shown. Description: With this hack, you can now change any or ALL of the seven default altititudes. It's very simple. Just change the default altitude vaules to anything you desire. Not necessarily in ascending order. For example, my set of altitudes are 100, 200, 300, 400, 550, 7000 and 1000! Link: None. Open the VIEWS.ASM file. Then follow the code hack shown. The magic value of -45 seems to work wonders. Description: The views now show more of the ground than the sky. That's all it does. The results can be ... dramatic if you're into air-to-ground attacks and all that stuff. Like cratering a runaway and mowing down soft targets with your plane's Mauser cannon. BEFORE the hack. The ratio of sky:ground height is 1:1. The default game's symmetrical proportion. But this game's strength is on the ground pounding and mud-moving action, no? AFTER the hack. See the difference now? The hack gives the view an asymmetrical treatment. The ratio of sky:ground height is now a staggering 1:6! More interesting, perhaps Sparky? Or is it too much? Now there is more ground view for your eye to absorb the details. What about SAMs? Well in Tornado you will hear SAMs on your RWR more than see them, so less sky doesn't really matter. The (in)famous JP-233 run on a runaway. You get more stuff to look around as you whizz by. Hit F2 (Satellite View) and you get this interesting view as a side-effect of the hack. give an interesting new perspective when the airplane banks. This video will give you an idea what is possible with the hacks. Hopefully this hack will open up new possibilities and experiences when playing a ground strike mission. Cheers. Link: None. Open the VIEWS.ASM file. Then follow the code hack shown. I've managed to adjust the height of the weapon overhead view and to make the overhead view pan left and right. Which view you say? You know after your bomb hits the target, resulting in crater or a series of craters? That View! Well, now you can pan left and right slowly or fast. Plus slight zoom-in and zoom-out.Now I share the secret of my latest Tornado hack. The Rotatable Overhead View. See the image below! 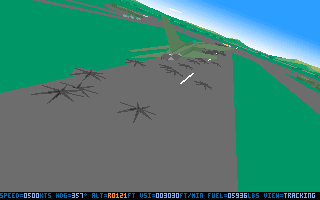 In the standard Tornado game, once your bombs hit home, you were looking straight down at some craters. The view was static. Now with my hack, I can swivel (rotate) left or right around the centre of smoking craters of what used to be the target. I can also zoom in and out but the zooming actions are very limited. I am also higher up compared to the standard game's Overhead View height, and I am looking not straight down at the craters, but rather at an angle. The default Overhead View height was 500. I changed it to 600. No reason why you can't edit the value and make it 800! That would give you a better bird's eye view of how well the Squadron's strike of the airfield was. In the screenshot below, I changed the VP_PITCH 384 value to -110. This accounts for the angled look down in my modified Overhead View. Makes this a bit more dramatic, eh Sparky? See line 2657's "call AdjustWpnTrack"? Ah, that my friend, is the key that allows me to rotate left or right once I am in Overhead View! This is a true Frankie Tornado innovation. So the view of what's left of my target is no longer static, I can rotate the view and enjoy the results of my handiwork. With my hacks so far, when you go to the Overhead Weapons View (key v), you will head the bomb explode as it strikes home. Then you can rotate around the craters and from a higher up height so that you can survey the damage done by your Squadron. Tally ho! I hope you enjoyed this as much as I enjoyed discovering it. Great stuff Frankie. You are very passionate and committed. Your hard work and determination has started to give results like the above. Many thanks for the encouragement. It wouldn't have been possible without your generous and selfless support, and the Dogs Of War Virtual Unit website and forums. With this hack, the Spectator View comes to life. 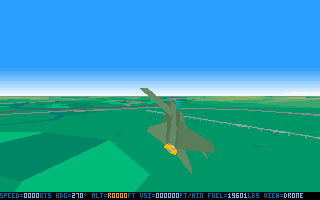 In the default game, when you hit the F4 key, all you have is a view of the rear of your Tornado, rapidly retreating away from you until it becomes an indistinguisable pixel. You can't do anything else. NOW HOWEVER, with this hack, after hitting the F4 key, you can rotate the view along the horizontal axis (using the z, x, Shift-z and Shift-x keys)! How can this View become useful? Most probably in a multi-plane mission where after bombing a target, you can continue to view your wingman hitting their assigned targets over the same area. So for example, hit the F4 key. As your jet flies out of view into infinity, you rotate the view left or right to catch the action of the wingmen bombing their targets. So this hack makes the Spectator View more useful. Here's the hack in action on Youtube for you to see the difference it now makes to the Tornado experience. The last 20 seconds of this video show you how useful the hack is. Here's my take on this. Suppose a flight of six tornado, led, ahem, by me, were to strike a target with mine being the first to ingress. A few seconds later the others hit various installations of the vicinity. So after I pass over the target and release my ordinance, I hit the F4 key and then hold down Shift-z to rotate the camera counter-clockwise. The target ground area rotates into view, just in time to catch the rest of the squadron lay waste the target area. Now can you imagine the cinematic possibilities?